Chinese politicians outshone their British counterparts yesterday by focusing on the “aah” factor. 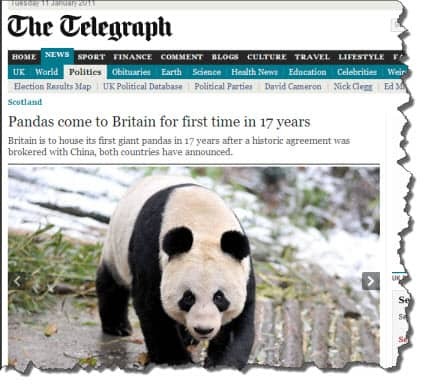 While British trade ministers were busy talking about new business relationships between the UK and China and all the prosperity it will bring, the Chinese Vice Premier appealed to emotions rather than economic logic and promised Scotland would get a couple of pandas. All together now..”aaah”. But no matter what you were doing yesterday, if you heard the word “panda” on the radio, or read it in a newspaper or online, there can be little doubt you immediately conjured up an image of a black and white creature eating bamboo. Unless, of course, you thought about that 1980s icon, the Fiat Panda…! One word and a movie played in your mind’s eye. It’s a game you can play. Try these words: Arctic, Tucson, Santa. Three words, three different images – a cold desolate landscape, a shooting outside a Safeway store and a big fat man in a red and white suit. Your brain needs very little material to produce lots more. Search engines have made many of us think that keywords matter only to people who type stuff in search boxes. Indeed, many website owners focus on keyword strategies to get them to the top of Google, for instance. Whilst tools like Market Samurai will certainly help you in the battle with other websites for search supremacy, they can take your mind away from what’s important – connecting with people. So, consider not only the keywords that work for search engines but the ones that also work for people. After all, a search engine only presents your material – it is people who will engage with it. As the Chinese delegation proved yesterday, they keywords you need are the ones that trigger images immediately and which also have an emotional impact. One word – panda – not only presents an immediate and clear image, it also has emotive value. When you combine both of those features in your keywords you engage your reader’s brains on a different level to “ordinary” keywords. So here’s a way you can make this all work for your website. The result will be your pages will be found and listed by the search engine ranking systems AND your pages will appeal to people because of the emotional keywords you use for them. Often you will find that when you check an emotional word back in your keyword tool you get better search engine possibilities anyway. Yesterday, the Chinese delegation did exactly this – some business words to get the attention of the relevant organisations and the emotional words to make the rest of us think nice and fluffy things. As a technique, it’s not a bad idea.